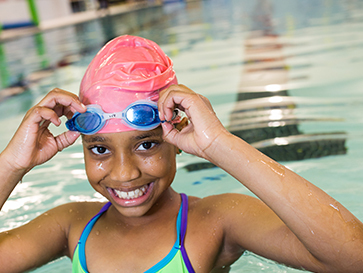 In 2011, Boys & Girls Clubs of Boston adopted the goal of ensuring all Club members learn to swim. As a result, BGCB made additional investments in our aquatics programs and initiated a protocol of swim testing every new member at our freestanding Clubs. Since the program’s inception, 2,266 members have learned to swim. Successfully passing the swim test is defined as reaching Level 4 in the Red Cross ladder of proficiency. Members who do not pass the swim test attend swim lessons until they reach proficiency. The Boston Globe recently reported on how drowning is one of the leading causes of unintentional deaths for youths and adults. The Globe highlighted BGCB as a resource for free swim lessons for members at all skill levels. * Swim lessons in the Clubs promote safety awareness in the water, which may prevent the loss of life. Multi-level swim lessons at a minimum of three times per week, and at least once a week for each age group and ability level. Lessons are based on Red Cross’s swim program. Recreational swim is offered weekly for all age groups and abilities, with scheduled drop-in times. Swim team practices are held three times per week, with a minimum of seven meets each season. One lifeguard training course (ages 15-18) and one junior lifeguard training course (ages 11-14) are offered each program year, which includes American Red Cross First Aid and CPR certification/recertification. New programs and activities are piloted annually in support of member growth and development within BGCB’s three priority outcome areas—academic success, good character and citizenship, and healthy lifestyles. *Membership is $25 for kids 6-12 or $5 for teens. To become a member find a Club in your neighborhood. Other local Clubs that provide swim lessons include Boys & Girls Clubs of Dorchester and The West House Boys & Girls Club.